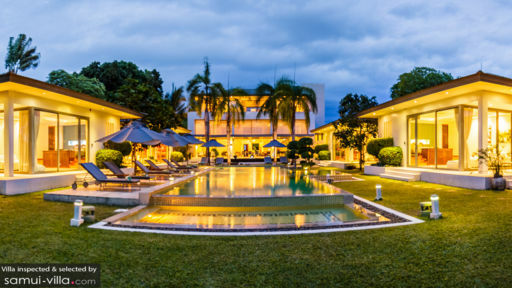 Baan Asan is a seafront vacation complex that’s comprised of five pavilions highlighting contemporary tropical opulence. Spacious interiors are appointed with mostly well crafted, modern and chic furnishings, fixtures and pieces. At the same time, amenities are uncompromisingly top-of-the-line – for each and every guest’s utmost satisfaction. 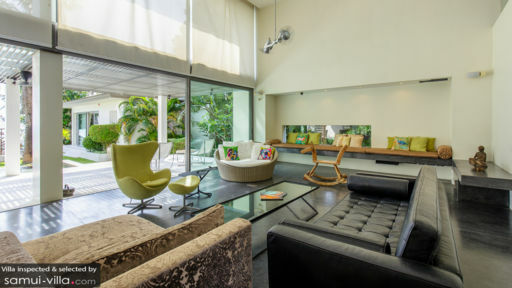 Baan Asan, truly, creates for you coastal vacation living with an ambience that’s definitely sophisticated and peaceful. The villa has five air-conditioned bedrooms. The master bedroom, on the third level of the main pavilion, has a king-bed, a dedicated bathroom with a fitted bathtub and a rain shower, a kitchenette and a living area. This bedroom also opens out to a long and spacious, furnished balcony with magnificent views of the seascape. Four other guest rooms are in individual pavilions on both sides of the swimming pool – two pavilions on each side. All four bedrooms have king-beds, dedicated bathrooms with sunken bathtubs and rain showers, as well as living areas. All four bedrooms also have direct access to the swimming pool. Within two of these guest rooms, though, are bunk bedrooms especially for the kids. The centerpiece of the property’s exterior is the 20-meter swimming pool. Plunge into its alluring, glassy waters for some unmindful wading, or for some splashy play. Then relieve sore muscles in the bubbly and heated waters of the pool’s built-in jacuzzi. 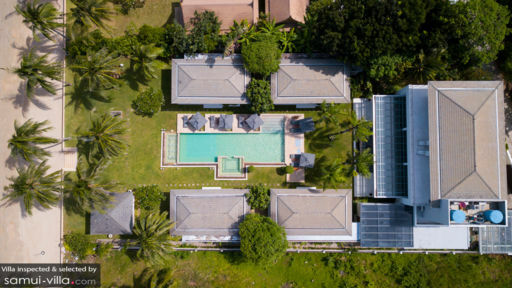 Up from the water, you can lounge on cushioned, pool beds partially covered by large umbrellas on the poolside stone deck, or sit back on the fitted couch of the sala at the edge of the property. On the sunny, airy and high-ceilinged ground level of the villa’s main pavilion is the living area. Around its luxurious and long couches as well as stylish chair, you can all assemble for amusing and animated sharing and storytelling. There are two dining areas. The indoor dining area – with its long and wide, timber wood table good for 12 – is right across the living area. The alfresco dining area – with its timber wood table good for 10 – is out on the main pavilion’s covered terrace. Whichever you prefer to dine at, you can all savor authentic Thai specialties – as well as foreign fare – whipped up by the resident chef at the villa’s professional kitchen in a separate room on the main pavilion’s ground level. Behind the living area is the media room where you can catch shows you’ve been following closely. Or, go on a marathon of your can’t-get-enough-of movies. The villa also has a gym and a library on the main pavilion’s second level where you can do your fitness regimen, as well as spend some alone time catching up on your reading. In charge of carrying out the villa’s day-to-day services is a friendly staff headed by a manager backed by mostly housekeepers and security personnel. In addition to the chef, a babysitter, a driver and a spa therapist may, upon your request, be called in. However, their services will be charged separately. Car rental is also available. Baan Asan is based within Taling Ngam Beach. Take a traditional, long-tail boat and set out to the neighboring islands. On another day out, get the prized catch at TopCats. Then get to appreciate nature even more at the Butterfly Park And Insect Kingdom.